It’s not running a marathon, writing a novel or traveling around the world — it’s so much simpler and easier than those things. It’s heart screening, and it could save your life. The statistics can be scary — according to the Centers for Disease Control and Prevention, in 2009, almost 300,000 women died from heart disease. Even scarier? Of those who died suddenly from coronary heart disease, more than half didn’t show symptoms. However, the American Heart Association offers a light in these dark numbers: heart events in women can be prevented more than three quarters of the time — through measures like early treatment and lifestyle changes like exercise, eating healthily and not smoking. In about five minutes, a pinprick and an arm cuff, patients can get a window to their heart health and learn their blood glucose (blood sugar), total cholesterol and blood pressure — indicators of potential heart disease risk factors that patients may not realize. Zachary Ritchey, PharmD, spent his Feb. 26 at the Hyatt in Downtown Austin, TX, conducting heart screenings at a Go Red for Women luncheon put on by the American Heart Association. A quick pinprick to the finger is the first step to cholesterol screening. A machine will then give the blood’s total cholesterol level. Total cholesterol means an equation of a person’s HDL cholesterol, LDL cholesterol, and a fifth of his or her triglycerides. The National Institutes of Health (NIH) recommends a person’s total cholesterol stay below 200 milligrams per deciliter (mg/dL). However, other organizations, such as the American Heart Association, say the threshold should be lower — below 180 mg/dL. Too much cholesterol in the blood may cause narrowing of the arteries, resulting in heart disease and possibly a heart attack. 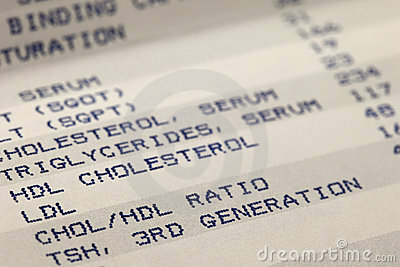 A full lipid panel is an in-depth cholesterol reading. Instead of summing HDL, LDL and triglycerides, a full lipid panel breaks it down by component. LDL stands for low-density lipoprotein and is considered “bad” cholesterol because if there is too much LDL cholesterol in the blood, it can start to build up in the walls of arteries. HDL, or high-density lipoprotein, is considered “good” cholesterol because it helps remove LDL cholesterol from the blood. Triglycerides are also a fat and are used as energy reserves. The NIH says that an individual’s HDL cholesterol should be above 60 mg/dL, LDL cholesterol should be below 100 mg/dL and triglycerides should be below 150 mg/dL. Glucose is sugar made from carbohydrates and used for energy. Blood sugar is regulated by the hormone insulin, but if a patient has type 1 diabetes, his or her body does not produce insulin. In type 2 diabetes, the body becomes resistant to the insulin produced. Diabetes patients are at higher risk of developing heart disease, but keeping blood sugar under control may reduce these risks. To test blood glucose levels, a doctor will take a blood sample. According to the American Diabetes Association, blood glucose should be below 200 mg/dL. When the patient is fasting, a good reading would be below 100 mg/dL. For a longer-term window into a patient’s blood sugar, a hemoglobin A1c screening can be conducted. This monitors and averages an individual’s blood glucose levels over a quarter of a year. This test is used to diagnose diabetes or understand how well a diabetes patient is managing the condition. For an individual without diabetes, the American Diabetes Association says a reading should generally be below 6 percent. A diabetes patient should aim to have his or her A1c reading below 7 percent. Blood pressure is measured using a cuff, generally placed on the patient’s left arm. Current NIH guidelines say a healthy blood pressure reading is 120/80 millimeters of mercury (mm Hg). The top number is systolic pressure, which is when the heart squeezes to pump out blood. The bottom number, diastolic pressure, is when the heart is resting. Blood pressure can vary throughout the day, affected by factors like stress and diet. Apple- or pear-shaped? Excess body weight can play a role in heart disease, but where on the body that fat is located may also increase heart disease risk. Too much fat around the stomach area can be dangerous and may contribute to both heart disease and diabetes. A doctor will measure a patient’s waist at the belly button. According to the NIH, a man's waist should measure less than 41 inches around, while a woman’s waist should be be under 36 inches. An equation of height and weight determines an individual's body mass index (BMI). There are generally four BMI tiers: underweight, healthy weight, overweight and obese. Being overweight or obese puts a patient at risk for many health problems, including heart disease and diabetes. Being underweight may also negatively affect the heart. The American Heart Association recommends most people start heart screening tests around 20 years old. The patient’s doctor should then recommend how soon the patient follows up. Doctors’ offices offer these screenings, as do many pharmacies and some local or state health departments.